Making the journey of rehabilitation a little easier and creating a future for patients, families, and friends. GPS – PUT IN 1 HALE AVENUE. ONCE YOU TURN ONTO HALE AVENUE YOU WILL PASS THE Crown Plaza ON YOUR RIGHT. These pictures are taken from the front (left handed picture) and from the back (right handed picture). THERE ARE Meters available on THE right side of street or proceed straight into mall parking. Our building is adjacent TO AND on left of THE entrance to parking structure. *Meters are monitored very closely by the city! 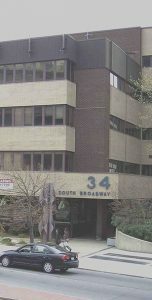 Above are pictures from the front of the building (left hand picture) and the back of the building noted on the right hand side. LEFT TURN ONTO BLOOMINGDALE ROAD + GO ONE BLOCK . PARKING: METERS ON THE STREET OR PROCEED INTO THE WESTCHESTER MALL PARKING LOT AT THE END OF THE BLOCK. EXIT AT # 8 WESTCHESTER AVENUE.